Couldn't agree more with Simon. 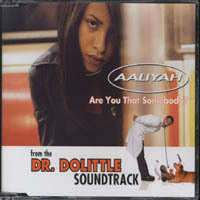 98's 'Are You That Somebody' (beautifully evoked by SFJ in his NYT piece) was Timbaland's peak moment for me, too: a swooningly heartbreaking Aaliyah vocal, a gorgeously lovelorn lyric, that found-sound baby-crying looped sample (like some displaced fragment from Lee Perry's schizoverse), and Timbaland at his most impishly inventive and rythmically innovative, pulling the rug from under your feet while keeping you dancing. I remember thinking, this is it, this is definitely as good a Pop record as has ever been released. What you could hear were possibilities, whole new vistas opening up, Pop (and with it, life) being renewed. That's precisely what I'm missing from Timbaland (and Pop) now. Timbaland's undoubted competence today cannot but sound infinitely inferior to the giddy thrill of discovery on those 97 and 98 tunes. (Another moment of casual incandescence: Ginuwine's 'Same Ol' G', almost thrown away on the Dr Dolittle OST). They were more than 'good records', which is what we're invited to settle for now, they were new ways of hearing, new ways of perceiving, of being affected. It's because Pop is more than music that 'good records' shouldn't ever be enough. Worth noting that SFJ's analysis reinforces the point I've made here about hip hop's hegemonic spread. 'Over the last decade, hip-hop has become that common tongue for global pop, and what we might call Timbatunes are establishing how that language is spoken right now.' SFJ is being celebratory, triumphalist even, yet there's obviously another way of reacting to this duopolization. Becoming 'the default moves for much of pop music' is a mixed blessing at best. The fact that 'the Rolling Stones hired the Neptunes to do a remixed version of ''Sympathy for the Devil"' might be 'an indication that something or someone is not going away' yet it's also, inevitably, an indication of total incorporation. That wouldn't matter in itself - one shouldn't despise success in the name of some hipsterish outsider-cred or elitist exlusivism - yet this level of acceptance is almost always a sign that an artist has ceased their process of becoming, of self-overcoming. They're no longer intense, in tension; everything is resolved, recycled, recognisable. 'A procedural machine stamping out hollow gloss-encapsulated placebos', as Robin put it. The remarks Simon quotes from Timbaland scream out weariness and ennui. He certainly don't sound like no poptimist. Timbaland sounds like Kurtz at the end of Apocalypse Now: he's waiting, wanting someone to kill him off. That's what we need, something to reset the defaults . He's clutching at straws with his appeal to country and rock, they are themselves default fallback options, solid blue chip stocks in a time of uncertainty. The assassins won't come from that direction. They'll come from somewhere unexpected.